Born in Jeremie, Haiti, Oct. 6, 1934, into a devout Catholic family, Auxiliary Bishop Guy A. Sansaricq decided at age 13 that he wanted to become a priest. He attended the seminary of the Jeremie Diocese for five years, after which he received a scholarship to St. Paul’s Pontifical Seminary in Ottawa, Canada, where he studied philosophy and theology for seven years. In 1960 he was ordained a priest in the cathedral in Port-au-Prince, Haiti. After ordination he was assigned to the cathedral in Les Cayes, but after a year he was assigned by his bishop to serve as chaplain for Haitian immigrants in the Bahamas, ministering from the Benedictine Priory of St. Francis in Nassau. In seven years in that work, he became aware of the plight of immigrants, and especially undocumented immigrants. When he completed his work in the Bahamas, he was given a scholarship to study social sciences at the Pontifical Gregorian University in Rome, where he received a master’s degree in 1971. In that same year, he was accepted to serve in the Diocese of Brooklyn and was assigned to Sacred Heart parish in Cambria Heights, where he served for 22 years. During that time, he was appointed diocesan coordinator of the Haitian Apostolate. In 1987 he was selected by the U.S. bishops to head the National Haitian Apostolate. In 1993, he was named pastor of St. Jerome’s Church in Flatbush, where he has continued to minister. He was named a Prelate of Honor by Pope John Paul II in 1999. 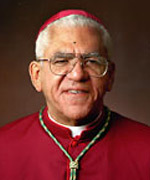 Bishop Sansaricq’s involvements include publishing a quarterly newsletter on Haitian matters concerning the Church, conducting a pastoral institute in Creole that attracts 90 students annually and organizing an annual convention of the Haitian Apostolate, and coordinating an annual retreat for priests and a yearly youth congress. He is also a co-founder of Haitian-Americans United for Progress, a service agency.